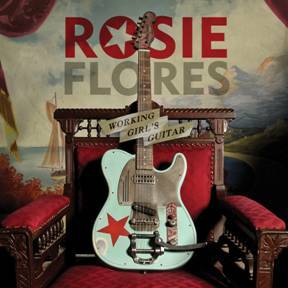 Veteran Austin, TX rockabilly musician Rosie Flores is poised to release her new studio album. The record, Working Girl's Guitar, comes out on October 16th. The title track sets the tone for the album. It's a confident country rocker that uses a beaten up but proud and strong guitar as a metaphor for the working girl herself. Be it the rambling rocker "Little But I'm Loud" or the nimble ballad "Yeah, Yeah", Flores earns her reputation as an exceptional guitar player. Using her guitar this working girl can sure get the listener moving. Standouts include the hip-shaking "Too Much" and "Drug Store Rock and Roll" which will cause you to jive and wail (but alas, not jump). Surf's up on the fiery instrumental "Surf Demon #5". Proving she has a vulnerable side as well, Flores has a handful of songs about love gone awry. "Love Must Have Passed Me By" is a resigned reflection on what could have been. The yearning "If (I Could Be With You)" is a boozy saloon piano number. Flores' cover of The Beatles' "While My Guitar Gently Weeps" improves on the original. A shuffle and plink takes the tired old song into completely new places. Anyone looking for a strong female musician who can strike a great balance between attitude and fun should spend some quality time with Rosie Flores. Best tracks: "Working Girl's Guitar", "If (I Could Be With You)"